Gov. Bill Walker's re-election campaign has started to recast itself after the sudden resignation of former Lt. Gov. Byron Mallott on Tuesday, three weeks from Election Day. Away went photographs of Mallott from the campaign's website. Away went the biography about Mallott's family and career. Away went his name from the campaign's logo that now simply reads "Walker" on the site. But scrubbing Mallott out of the campaign is complicated. Not only does Mallott's name remain on plenty of campaign material, including signs across the state, but Mallott also resigned too late to remove his name from the Nov. 6 ballots. So when Alaska voters head to the polls — and 20,000 ballots have already been sent out — Mallott will still appear there as Walker's running mate. Even before Mallott resigned over unspecified "inappropriate comments" he made to a woman, Walker was already locked in a tough race for re-election. He's up against former U.S. Sen. Mark Begich, a Democrat, and former state Sen. Mike Dunleavy, a Republican. Libertarian candidate Billy Toien is also running for governor. Walker supporters and people in Alaska's political sphere speculated Wednesday about whether or how Mallott's resignation would impact Walker's campaign. Some supporters of the Walker-Mallott ticket said they will still vote to re-elect the governor. Some had questions about what the change means. Mallott has not yet made any public comments about stepping down, aside from those in his resignation letter that was released by the governor's office Tuesday. A large Walker-Mallott campaign sign remained outside his house in Juneau, The Associated Press reported on Wednesday. Walker's campaign staff spent a lot of time on the phone Wednesday with the Alaska Public Offices Commission and the Alaska Division of Elections to understand how to best incorporate the new lieutenant governor, Valerie Nurr'araaluk Davidson, into the campaign, said Walker's campaign manager John-Henry Heckendorn. If Walker is re-elected, he would name Davidson his lieutenant governor, Heckendorn said. Davidson was sworn in as lieutenant governor Tuesday after Mallott's resignation. She previously served as commissioner of the Alaska Department of Health and Social Services. "We can't really get into the functionality of designing logos and re-branding until we decide from a legalistic standpoint what the options are," Heckendorn said. "The path that I think we're going down is making it really clear that a vote for Walker-Mallott is a vote for Walker-Davidson, telling Val's story and making sure that it's clear how incredible she is." 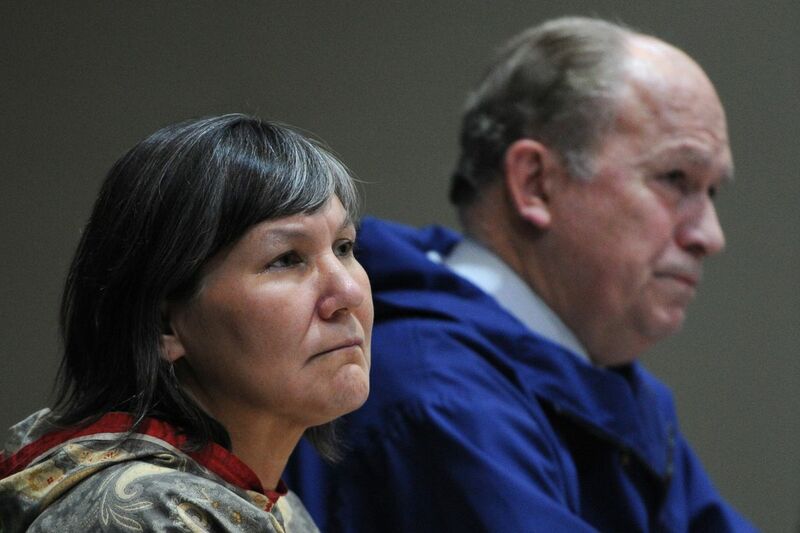 Walker and Davidson were together Wednesday afternoon at the Egan Center in downtown Anchorage for the annual tribal conference organized by the Alaska Federation of Natives and the National Congress of American Indians. Both spoke to a room full of people whom Mallott had originally been scheduled to address. Outside the event, Walker had confirmed to reporters that he plans to stay in the governor's race. Asked what Mallott's name on the ballot means for going forward with the campaign, Walker said: "We have more work to do." Mallott's resignation will absolutely impact the governor's race, said Jay Parmley, executive director of the Alaska Democratic Party. He said he didn't see any way it wouldn't. It complicates messaging, he said, and the Walker campaign must now explain why Mallott's name remains on the ballot, and what a vote for the Walker-Mallott ticket actually means. "It requires an explanation, and you don't do that easily in a 30-second sound bite," Parmley said. Mallott's name will still appear on the ballot because the ballot had already been certified and printed by Tuesday, and the elections division had already sent more than 20,000 ballots out to voters, according to the division. Under state law, candidates must withdraw at least 64 days before the election, the division said in a statement Tuesday. If Walker is re-elected, Mallott will technically be re-elected along with him. However, given his resignation, Walker would be able to appoint a lieutenant governor, the division said. Walker would appoint Davidson, according to Heckendorn. "It's bad to lose your running mate, I lost my running mate," said Andrew Halcro, executive director of the Anchorage Community Development Authority. He was referring to his 2006 run for governor, when his running mate Ken Lancaster dropped out due to health reasons. "It's worse to lose your running mate after the ballots are printed." Parmley, who is supporting Begich in the election, said he hopes Walker drops out of the race. Dunleavy has been leading in polls, and there have been concerns among some Democrats that Begich and Walker will split the vote, handing a win to Dunleavy. Parmley said he did see a path to victory for Begich, but not Walker. "You hate to kick people when they're down but the fact of the matter is the governor can't win," he said. "I felt that way for a long time, this just crystallizes it." At this crucial point in the campaign, "there's not a lot of persuadable people," said Matt Larkin, a political consultant who does work for Dunleavy for Alaska, an independent expenditure group that supports Dunleavy. "I'm not sure this really changes much. If it benefits any of the Walker opponents, I think it benefits Mark Begich," Larkin said. As speculation swirled Tuesday about what Mallott's resignation meant for Walker's campaign and Begich's campaign, Parmley said he got a call from Begich. Begich told him that any rumors that he would serve as lieutenant governor under Walker weren't true, according to Parmley. "He put that rumor to bed, there's no deal, there's never been a deal," Parmley said. Begich's campaign manager, Nora Morse, did not return phone calls Tuesday and Wednesday, and did not answer specific questions sent by text message about whether Walker and Begich had been in talks about a path forward, as Heckendorn had said Tuesday. Heckendorn said those conversations were unrelated to Mallott's resignation. Begich was in Ketchikan Wednesday to speak at a convention and also told the Ketchikan Daily News that the conversations happened before the resignation. He said nothing had changed about his campaign. "We know November sixth is around the corner so we ain't stopping," Begich told the newspaper. "… Nothing has changed with our campaign; we are full steam ahead." Morse pointed reporters to a statement on the Begich campaign's Facebook page posted Wednesday. Begich said in the statement he was shocked and saddened to hear about Mallott's resignation. He said he believed accepting the resignation and replacing Mallott was appropriate. "There must be a zero tolerance policy for inappropriate behavior of any kind from our elected leaders," Begich said in the statement. Dunleavy said in a statement Tuesday that his campaign remained "focused on restoring trust in state government." His campaign, he said, "has always been about the people of Alaska, not politicians." The most likely outcome after Mallott's resignation is that both Walker and Begich continue forward with their campaigns, Alaska Republican Party chairman Tuckerman Babcock said on Wednesday. "I certainly hope it doesn't result in a bunch of scheming, plotting, manipulating the process behind the scenes to figure out how to win an election," he said. "Up until yesterday it was the Bill and Byron show," Babcock said, calling that a "strong team that dissolved overnight." "That puts him in an awkward spot to try to get re-elected," he said. Walker, a Republican-turned-independent, and Mallott, a Democrat, teamed up in the 2014 election, merging their campaigns. Mallott, who had won the Democratic nomination for governor, stepped off the ticket to support Walker and run for the lieutenant governor spot instead. Walker and Mallott won that year's election on what they called a unity ticket. Babcock said he also thinks Alaskans should be told what Mallott's comments were. Walker has described Mallott's comments as "inappropriate overtures," but would not specify Wednesday what that meant. In interviews Wednesday, some people and groups who have supported or endorsed the Walker-Mallott ticket earlier in the campaign season said they plan to continue supporting Walker's re-election bid. That included Don Gray, a former chairman of the Alaska Democratic Party who posted a petition on MoveOn.org in August calling for Begich to withdraw from the race. Gray said his support for the re-election of Walker remained unwavering and he was saddened to hear of Mallott's resignation. "I'm still trying to figure all of this out. I'm very sad to hear that Byron resigned," Gray said. "To resign his office right now is really a tragedy, and I'm having a hard time understanding that." Rep. Adam Wool, D-Fairbanks, was one of the people who signed that online petition. He said on Wednesday that Walker is still his first choice out of the three candidates. However, he said that the resignation, "puts a bump in the path." Halcro said Wednesday he plans to vote for Walker. He thinks Mallott's resignation will be "irrelevant" to the outcome of the race. "People expect Walker and Begich are going to split the vote regardless of who the running mate is," Halcro said. "If the race was tighter, if Walker was closer to Dunleavy you could see where that could have an impact on the race. Unite Alaska, the independent expenditure group that formed in support of the re-election of Walker and Mallott, is "not wavering" in its support of the governor's re-election, according to an emailed statement from Barbara Donatelli, co-chair of Unite Alaska and senior vice president at Cook Inlet Region, Inc.
Rep. David Guttenberg, a Fairbanks Democrat, also signed Gray's petition and said Wednesday he would continue to support Walker's re-election bid. He also supported Davidson as the new lieutenant governor. "The problem was taken care of," he said. "Before it ever became public, they were proactive and did the right thing and Byron stepped aside and now they have an even stronger ticket now." Davidson was confirmed as lieutenant governor-designee earlier this April, according to the governor's office. Guttenberg said he understood people wanted the "juicy details" of what Mallott said, but he believed the more information given out, the closer people would become to finding out the identity of the woman whom Mallott made the comments to. "I think that one of the things that (Walker) has done in his four years in office is he's done the right thing, regardless of what people want and I think protecting the woman involved is the right thing," Guttenberg said. "Byron is gone. You move forward." Halcro thinks both Walker and Begich are "in it 'til the end," he said Wednesday. Even if the "world changes" and the two were to somehow team up, he added, there's so little time left. "I don't see how you get a coordinated message with three weeks to go," he said. Some of the people at the tribal conference on Wednesday said they were saddened to hear Mallott backed out of the race, but they said it seems to have been the right step. Richard Peterson, president of the Central Council Tlingit and Haida Indian Tribes of Alaska, said he's glad Mallott did the right thing, "falling on his sword" and quickly acknowledging his mistakes. "To be Tlingit means to be human," he said. "We're not going to ostracize him. We're going to support him." Peterson said he's keeping his support with Walker. Davidson is a strong choice as a running mate, he said. Phyllis Evan of Lower Kalskag said she will continue to support Walker and thinks Davidson will do a good job as his running mate. "She's from our area. We believe in her and she's a strong leader," Evan said. Henry Mitchell, a fisheries consultant, said he was a firm Walker-Mallott supporter. He had worked on Mallott's original campaign before Mallott quit as the Democratic Party's nominee for governor in 2014, and joined forces with Walker. Mitchell said he's not sure where his vote will fall now, with Walker or with Begich. He's waiting to see if there's a major change in the race, such as one of those two candidates backing out of the race, to help him decide. "I trusted his judgment and I'm saddened he dropped out," Mitchell said of Mallott. "I don't know the circumstances why." Dennis Robinson, the vice mayor of Unalaska, said he's sticking with Walker, because of his strong support for tribal issues, including recognizing tribal sovereignty in 2017. "It doesn't have a lot of effect on me," he said. Marie Katcheak, who lives in Stebbins, originally named Tarpaq, said she is standing by Mallott. "He's a good man. Everyone makes mistakes. He was brave enough to let us know, and he still shines for us as a terrific leader," Katcheak said. In August, Walker-Mallott received endorsements from the Alaska AFL-CIO, the largest labor organization in the state, and the National Education Association-Alaska, an organization of more than 13,000 members who work in Alaska's public schools. Tim Parker, president of NEA-Alaska, did not respond to messages Wednesday about whether the organization's support for Walker remained. A spokesman for NEA-Alaska said Parker was traveling. Vince Beltrami, president of Alaska AFL-CIO, did not return calls on Wednesday.